A look at the West Wall from the Black Mountain Lodge, mid-mountain at Arapahoe Basin. Photo taken prior to lift opperations Thursday. Lungs burning and already out of breath I turned around to check my progress, only to find that I was just a few hundred yards up the slope from Arapahoe Basin Ski Area’s base. “Really?” I thought to myself, seriously questioning my lung capacity and reassessing my recent conditioning regimen­ — at least in regard to ski mountaineering. I looked at my watch. 8:05 a.m. It had been five minutes since my dog Ike and I left the Jeep in the parking lot. Physical conditioning concerns aside, at least I’d made some progress. There were 55 minutes before the first chair would be loaded at the base. Would I make it to the lodge at midmountain in that time? The idea seemed reasonable, but my cardiovascular system had a compelling counterargument. Standing there on the slope, the decision to take the steeper route — because it would be faster — no longer seemed like such a solid one. How anyone in their right mind competes in ski-mountaineering racing was beyond me at that moment. We continued on, as I thought of some choice words for the old “earn your turns” mantra. The morning had started at 6:40. I was already behind schedule on account of one too many taps on the old snooze button. Having enough time to make it to A-Basin, get my gear on, click into my skis and skin up to the Black Mountain Lodge for a run before the lifts open was questionable. It was going to be tight. But I skipped breakfast, grabbed some granola bars and my coffee and shot out the door shortly after 7. With skis and skins on halfway up the slope, that was looking like a decidedly poor decision. When I’d arrived at 7:45 a.m. the parking lot was almost empty. A few ski patrollers were tooling around near a snowmobile and lift operators were starting their day at the base area. By the time I was halfway up the slope, a few patrollers and staff members were starting to ride the lift up. It was not yet 8:30. I started to feel better about my progress. It seems with any sport, there’s that initial threshold before the rhythm sets in. I can’t say I had a rhythm as I trudged on, but I was making progress. Ike was still bouncing around, ready to go. A few minutes later we crested the slope and the roof of the lodge showed itself. Re-energized like a marathon runner in the final mile, I charged on. Standing on the deck at the lodge the effort suddenly seemed worth it. Enjoying the moment and the quiet morning, I watched a patroller and mountain staff member get ready for the day ahead. Two men a number of years older than me, passed by and ski-toured their way farther up the hill. Not today, I thought, satisfied with midmountain. Shortly before 9 the restaurant staff unloaded from the chair, entered the lodge and fired up music for the day. It was my cue to leave. I looked at Ike lying patiently in the snow, unhooked his leash and said, “My turn,” as I prepared to race him down the hill. With light snow falling and clouds hanging along the ridge of A-Basin’s West Wall, we raced down the slope, the mountain almost to ourselves. Still leading, Ike veered off to greet a patroller setting up fences. Seizing the opportunity I passed them. Noticing, Ike picked up his gait and charged after me. Nearly neck and neck approaching the bottom, Ike lost his momentum. “I win,” I thought as we passed the 20 or so skiers and snowboarders waiting for the lift to open on our way back to the parking lot. A-Basin has the most lenient uphill policy of the Summit County resorts. It’s the only one that allow dogs on the slopes before and after lift operating hours. Dogs are permitted to be off leash and under voice command. 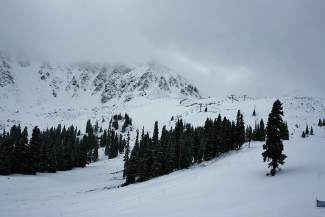 A-Basin is also the only mountain to allow uphill travel during lift operation times. Officials at the Basin do ask that uphill travelers register for a free uphill pass, as a precautionary measure. Copper Mountain, Breckenridge Ski Resort and Keystone Resort all allow uphill travel when lifts are not operating, assuming enough terrain is available and it does not conflict with operations. Mountain officials recommend checking their websites for guidelines and any recent changes or closures.